Rally Recruitment in some districts of Uttar Pradesh has been scheduled for Joining Indian Army as General Duty Soldier. 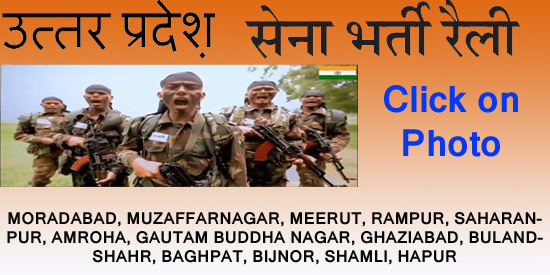 Candidates belong from GHAZIABAD, GAUTAM BUDDHA NAGAR,SAHARANPUR, MUZAFFARNAGAR, BIJNOR, RAMPUR, HAPUR, SHAMLI, BULANDSHAHR, MORADABAD, AMROHA, BAGHPAT, MEERUT may apply for various posts in Indian Army. Sol. GD, Clerk/SKT, Tradesman, NA, Technical etc. Meerut Army Bharti Registration dates : 01 May 2017 to 15 May 2017. Candidates who are registering online, they need to a valid email ID and mobile number for One Time Password verification. Candidates can also check illegibility while applying online. After registering online and submitting documents, you can download admit card before 15 days of rally.